Those of you who are already devout Vegans are probably familiar with all the plant-based eateries in West London; however, for those of you who are trying to do Vegan January or ‘Veganuary’, we have highlighted our favourite places – all within walking distance of FORM studios, you’ll be pleased to hear! So whether you’re looking to fuel up after a workout with some plant protein pancakes, or boost your energy levels with a pre-workout super smoothie, all the below eateries come highly recommended. There are of course numerous delicious places in Notting Hill that have vegan options (such as Farm Girl Café, Planet Organic, Bodyism, Jusu Brothers etc.) but if you don’t want to be tempted by plates of Eggs Benedict, the below are all pure Vegan – and sensationally delicious! Redemption’s philosophy of ‘spoil yourself without spoiling yourself’ is music to our ears. With a constantly changing seasonal menu, they offer superfood coffees, smoothies and desserts – all vegan and mostly raw. We love the Bombay Love smoothie, which is an immune-boosting blend of turmeric, ginger and pineapple. It’s also a fantastic place to keep up your ‘dry January’ as they only serve mocktails – but with all the wonderful flavours and colours (such as a beetroot espresso martini) you definitely won’t miss that glass of red with dinner! A new edition to Westbourne Grove, Juice Baby opened its second branch a few weeks ago much to the delight of the local cold-pressed juice addicts. Their Acai Verde is a twist on the classic acai bowl; super-alkalising as its blended with spirulina, its also topped with gluten-free granola, fresh fruits, cacao nibs and any extras you fancy. It’s a tough choice between the Grasshopper (a matcha smoothie with avocado, coconut water & coconut meat) and any of the heavenly sweet treats such as raw macaroons, raw snickers & raw pecan pie… Delicious! 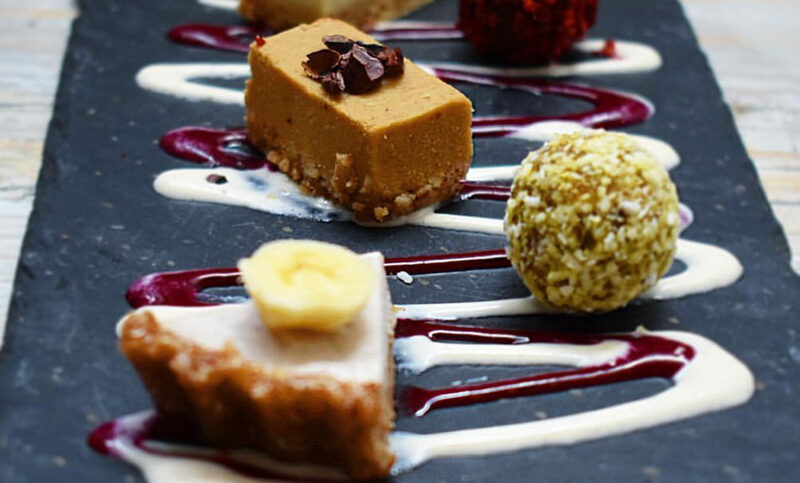 If there’s one restaurant in London that could convince you to ‘go raw’ then we’ve found it. Nama (literally meaning ‘raw’ in Japanese) specialises in serving the freshest raw vegan food – it prides itself in creating incredibly nutritious and interesting dishes, and presents them beautifully. From zucchini noodles, to raw cheesecake (try the blueberry) to cleansing & detoxifying juices, Nama is where Vegan dreams come true. You’d never believe how wonderfully tasty cashew nut ‘cheese’ can be! And if you loved your meal, why not take one of their raw food courses? We’re extremely tempted by this raw chocolate course for Valentine’s Day! Farmacy promotes the healing power of food through its menu of dishes inspired by cuisines of the Middle East, India and Asia. The décor is divine, and all their food is free from refined sugar, additives and chemicals – and you can truly feel it doing you good with every mouthful! We totally recommend trying the Farmacy Burger (a black bean garlicky burger on a sourdough vegan bun!) or any of their Farmaceutical Syringe Shots featuring serious superfood ingredients such as activated charcoal, shizandra berries and gotu kola. Such scrummy food to nourish your brain and frame – you’re body will definitely thank you for it!